Nov. 17th – 3-5 p.m. You are all invited to join us on Nov. 17th. 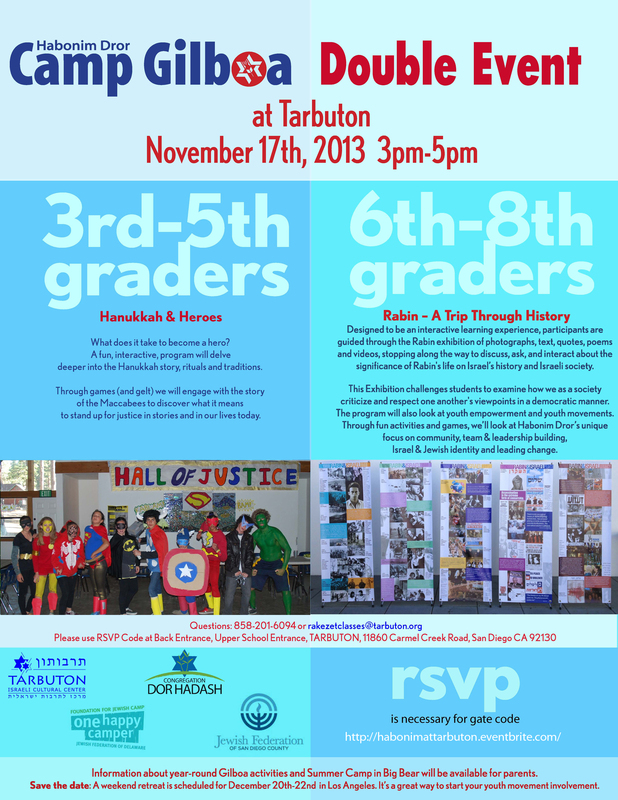 The Tarbuton is collaborating with a variety of youth groups and programs this year to encourage participation of older kids in Jewish and Israeli programming in San Diego. To read more about the full list of programs Click Here. The first event we partner with Habonim for Hannukah and for older kids a Zikaron Peula for Rabin.This program is open to the public, we expect children who are not enrolled in our classes to join us. Children in class from 3-4 can join in after. Please feel free to invite friends. In addition, we will have information about the March of the Living trip to Israel and Poland at 3 p.m. This program is open to Students but also this year for Adults. We will also have information and representatives at 4 p..m. about One Happy Camper summer camp scholarship information, Habonim Camp Gilboa in Big Bear and the Habonim youth programs during the year.